Mary Perkins Bradbury was the daughter of John and Judith Gater Perkins. She was born in Hillmorton, Warwickshire, England, and was baptized on 3 September 1615. Mary was about 16 years old when she left England and sailed with her family to New England, landing in Boston in 1631. At age 21 she made a wise choice and married Thomas Bradbury. Thomas was an agent for and kinsman of Sir Ferdinando Gorges, a key player in the early history of New England. Mary is my 8th great grandmother. Interesting, maybe only to me, her older sister Elizabeth Perkins Sargent is my 9th great grandmother. Thomas and Mary Bradbury lived for a short time in York, Maine but by 1640 they had settled in the new plantation of Salisbury. They were a successful couple, Thomas was a schoolmaster, town clerk, clerk of courts and a military commander. Mary had a successful butter business, making enough butter to sell to the sailing ships. They raised a family, losing some children along the way, as did most families of that period. All in all a respectable life, one in which I assume, they believed would continue until their deaths. Then came the hysteria of the Salem Witch Trials. Many witnesses testified against her, two described how she had turned herself into a blue boar and tried to trip the horse of their father. Samuel Endicott, grandson of Massachusetts Bay Colony Governor John Endicott, testified at the trial that he had been in a great storm at sea some eleven years before, when his captain later saw a pair of legs appear in the waves, then a woman in a white cap and a neck scarf from the middle up. He went on to say that since Mary Bradbury had sold the captain two firkins of moldy butter and only a witch would do such a thing, the apparition must have been her. James Carr accused her of making his sick for many months so that her son William could marry Rebecca Wheelwright Maverick. She had seemed to prefer James, but due to his illness he could not court her and she married William instead. Robert Pike, a highly respected Magistrate, his son Minister John Pike and many of her neighbors came to her defense. Her minister testified to her good character and her many works of charity. 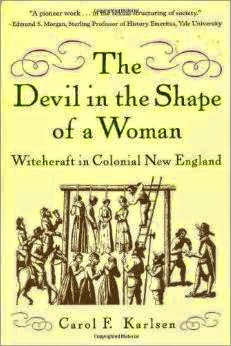 Mary Bradbury's trial came near the end of the witch trials which was spiraling out of control. Many people were protesting against the trials. When the accusers began to make witchcraft claims against the wive's of the most prominent men in the colony, the judges finally began to rethink the whole process. One hundred and eighteen of her neighbors testified on her behalf. Despite being found guilty and sentenced to hang she survived. Four others found guilty at at the same time were not so lucky. It is very possible that friends "spirited" her away. She died in December 1700. Jane Bradbury, her daughter married Henry True, son of Henry and Israel Pike True. Mary's sister Elizabeth Perkins married William Sargent. If you believe than any of this information is not correct, please let me know. 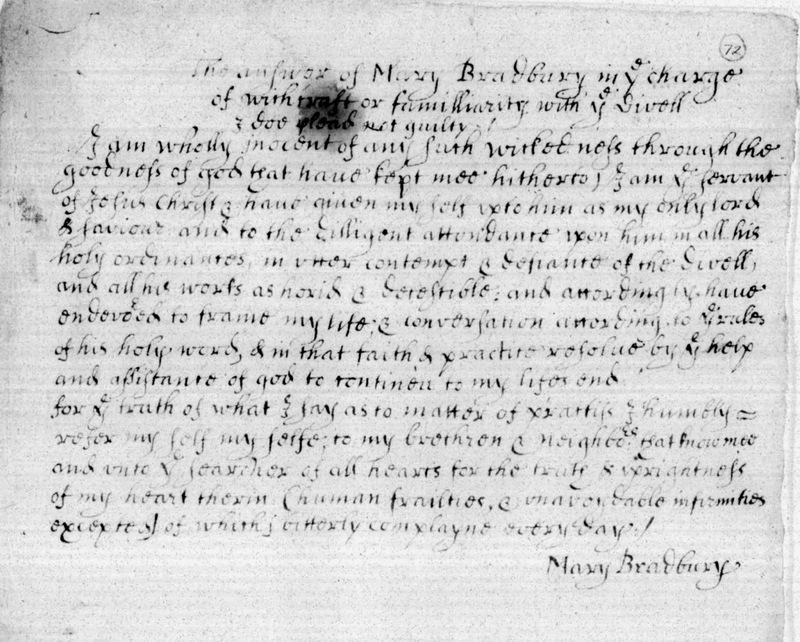 There are many great sources for information on Mary and the Witchcraft Trials, the best of which is this online source by the University of Virginia. Because so much is known about the trial and her marriage to Thomas I did not cite any sources. I did happen to see on both wikitree and ancestry.com some trees which have her married to a Richard Goldsmith in Wenham in 1647. I am not sure where that came from but it is obviously a mistake.